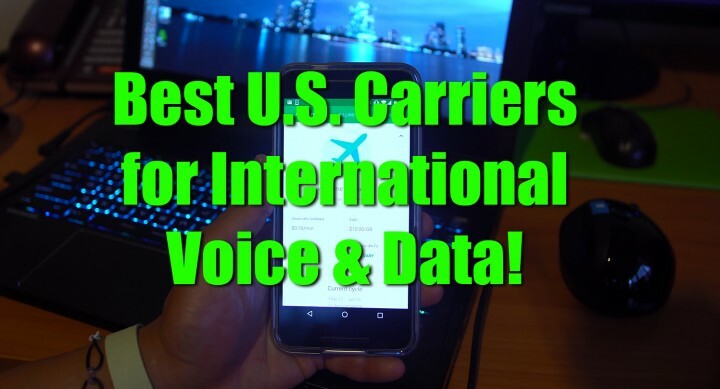 Best U.S. Carriers for International Travel Data and Voice! As a person who have traveled to more than 6 different countries in the last 6 months, I can tell you which U.S. carriers are the best for getting data and voice overseas. Before I begin, I have service on all 4 major U.S. networks including AT&T, Sprint, T-Mobile, and Sprint. I also have an account with Google’s new Project Fi. Why so many networks? That’s what I do for a living, test all the networks and find the best for you guys and I am always “high” on Android. Without a doubt in my mind, the best U.S. carrier for traveling overseas is T-Mobile. T-Mobile provides free unlimited 2G/Edge data and 20 cents per minute in most countries and they support over 140 countries. If you take a look at other carriers, they will charge you ridiculously large amounts for international data. Although not even 3G, with T-Mobile you will get unlimited 2G data which works fine for low-bandwidth apps like e-mail, Twitter, Facebook, Installation, etc…etc… At least no matter what country you go, you will always have quick access to your communication apps. Now you won’t be able to stream videos or anything that requires more bandwidth but you can leave those upto your hotel WiFi or grab a prepaid SIM in the target country. I was able to get full signal in Canada, Ireland, France, Spain, South Korea, and Thailand which are the countries I traveled to this year. Also, T-Mobile offers WiFi calling overseas. So long as you have WiFi connection, you don’t have to pay 20 cents per minute but it will be as if you were making calls within the U.S. If you have unlimited plan, this will means free calls so long as you have WiFi. Also, you will be able to use your U.S. number for incoming and outgoing calls. If you call your friend in the U.S. your friend will see your U.S. number as caller ID. If someone calls you on U.S. number, you won’t miss those important calls. If you have automated banking service that verifies you through caller ID, no problem. Now, Sprint offers WiFi calling also along with pretty decent international plan. Sprint includes 1GB of 2G data in North/South America but $30 per gigabyte when traveling elsewhere. To use international plan, you will also need GSM-capable device, meaning it will not work on all Sprint phones. You can check Sprint international plan here. AT&T charges a hefty 30-day fee with Passport, Passport Silver, and Passport Gold options all of which are very expensive for both voice and data, probably not a good solution for regular consumers. The one carrier you want to stay away for international travel is Verizon, they charge an outrageous $2.05/MB or $2050/GB!!! I know a few people who have used Verizon overseas and racked up a monthly bill over few thousand dollars while using data overseas. They do offer a separate monthly international plan which can be a bit cheaper but still very expensive and I would avoid them at all costs unless you worked for a mega-corporation that paid for all your travel expenses. Now, if you don’t have T-Mobile but you would like to have their international plan, you can opt to go with Google Project Fi, which works on T-Mobile, Sprint, and US Cellular networks. Project Fi has a feature where you can instantly pause your service, meaning you can use it only when you travel outside the U.S. if you want. They offer same 20 cents per minute for voice and $10 per GB on most countries with 2G data. This isn’t as good as T-Mobile’s unlimited 2G but you have the option to pause your service indefinitely and activate only when you need it. This may be a good option if you have an extra Nexus smartphone laying around. Overall, T-Mobile definitely rocks as international plan comes completely included, unlimited 2G data in 140+ countries, and this comes included with your monthly plan. You don’t have to sign up for anything, just bring your T-Mobile phone when you travel making it simple and easy. Add on the WiFi calling and you could literally run your whole business from some beach shack in the middle of nowhere so long as you have decent WiFi speeds. I will keep testing more U.S. carriers as I travel but for now, I am really lovin’ my T-Mobile S7 Edge in Thailand. Also, the best way to get 4G LTE/3G data overseas is to pick up a prepaid SIM in the country you travel to, which may be a smarter option if you are planning to stay more than a few days. I did pick up my 4G LTE SIM here in Thailand for that reason and I should have an update on that also next. If you have good experience or hacks on how to get cheap data/voice overseas, please share you opinions below in the comment box with others, thanks! I have T-mobile and took a trip to Japan and had a great experience. I had no ridiculous charges and T-mobile has some good prices 3g/4g data if you need it. I had wifi at my mother in law’s house so i can make free calls back to the US. I was skeptical at first, because free unlimited data overseas, really? I took a chance and talked to them and they assured me i would not be charged.